Knit, knitting, crochet, crocheting, sewing, spinning, dyeing, weaving, fiber arts, original patterns, yarn/fleece sources and more -- "String Theory 2.0"
Not yet . . . . This was a birthday present. I had thought of plying them together. Now I'm not so sure. Maybe singles? I have a pound of each (It's Ashland Bay multi Merino top in sandalwood and rose quartz, from Copper Moose). But I'm not going to even play with it until I finish the quilt. Here's the Sorting Hat, I'm working on Norbert, then off to machine land and finishing . 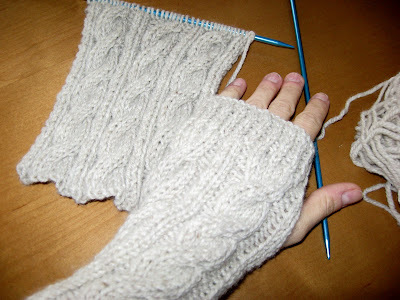 . . . .
Steph, from whom I got directions to this lovely pattern for Irish Hiking Wristwarmers, (I'm making them in Oatmeal Encore Worsted (left over from the Christmas Sweater - I love this pattern because it seems perfect for fun with leftover, you know?) responded to a comment on her blog which I found interesting and I wanted to weigh in. 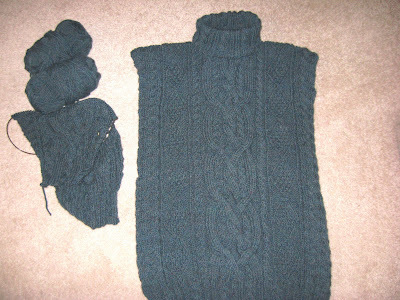 "I am a newby and just started a seed stitch sweater in All Seasons Cotton yesterday. The folks at the LYS said I could not knit bonnet in ASC but needed to knit it in the yarn it called for." Yarn substitution not allowed - what is this silliness????? Holy Soupnazi, people. Now, perhaps it's a misguided attempt to save a newbie from heartbreak which might scare someone away from knitting forever, but it doesn't sound conditionalized to me "of course you can, but to get a sense of the pattern, why not try it with the yarn called for first . . .". Why discourage in such a pedantic way when you can teach a larger concept like hand and it's role in design? People who knit/crochet/weave should understand the wonderful complexity of fiber design that is the interplay of gauge and material/fiber. Having to use only the yarn in the pattern sounds like a prison sentence to me. And what if you find a great older pattern and the proscribed yarn is no longer in production? Oh well, none for you? I love to knit, but I find some attitudes of those who share this love kind of saddening and too rigid. I'm also a librarian, and I feel the same way about some of my fellow practitioners of this line of work. Flexibility, adaptability, that's what I like about both knitting and doing whatever it is I do for money. Can I tell you, line by line how to make a cotton sweater for a 168lb. man with Aran cables on it? No, but I can figure it out for ya. Do I know, off the top of my head, if there is a particular form for attorneys to use in the state of Georgia to get a body exhumed? (Yeah, I figured that out too - the answer is only if you need to test the deceased's DNA, yuck). Anyone can learn by rote, memorize the facts, but that's what computers are for. Process, adaptation, that's why we have these big brains. Develop the skill of figuring things out, you'll never be stumped again. Or, not for long. Well, I've moved on to the sleeves, which are slow because they're done at the same time, but then, they're also completely done when they're done and they match, so it's worth it. I really hate going back and trying to make sleeves match, I can never do it, and non-matching sleeves are really stupid looking. I also like to put fronts and backs together when they're complete and do the neck, I don't know why, maybe once the sleeves are on the whole things gets unwieldy to put the neck on easily (harder to pick up those neck stitches if the whole piece is being pulled around by it's own weight?). Anyway, the result? The world's most complicated Dickie. Another color idea for spinning - sandalwood? Cats, dogs, how else to divide up one's projects? A while back I commented that some projects are like cats (self-contained) some like dogs (needy, demanding, usually very rewarding). Then the Mad Crocheter reminded me that I made a comment once that I liked to have 3 projects going at once; one really difficulty but fun (fair isle, lace, intense cables), one middle of the road (you can watch TV with this one) and one really straight forward one (basically something you won't get in trouble if you drink and knit). If I'm doing straight stockinette stitch, I don't have to look at my hands - well, unless it's cotton or something else that splits. But I haven't done anything like that in a while. So, who cares about this drivel, where are some pictures? I think I'm about ready to try another spinning project. Like traveling, I find spinning intense and I need a rest before starting on it again. or maybe Endicott or perhaps English Garden. Maybe I should take vote. 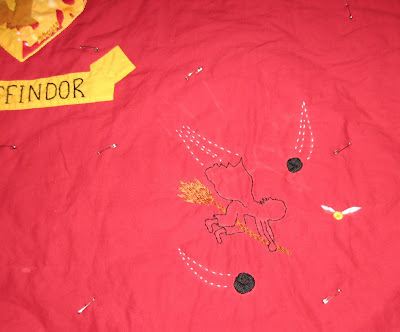 So, having assembled the layers, I was quilting designs from the headers of various chapters into the 4 corners that will show when the quilt is on the bed. Nice, but too subtle. So, at the husband's excellent suggestion I'm reworking them with the pearl cotton. 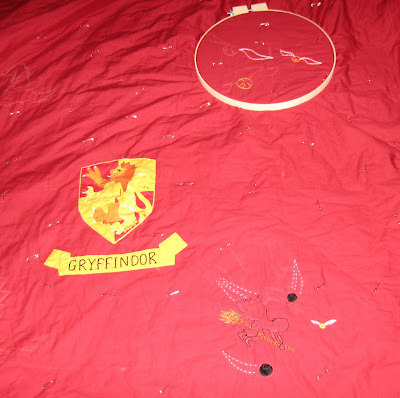 Now, there are two more designs in the other 2 corners, Norbert on the bottom and the sorting hat on top, but they don't show yet. The chalk shows up a lot in this, showing my unsuccessful drafts of this idea, but that will wash out. Once these designs are done, I'll fill in the remaining open space with stars and moons quilted in red and the machine sew the outer edge in bands and finish the edges. So, today the Mad Crocheter shared with me the exciting new fact (to me) that crocheting is apparently HUGE in Japan. I'm reeling, really and truly, I am. If you have a minute and like to laugh at translations into English, check out Amazon for "kyuuto" - Mr. Funky's Super Crochet Wonderful by Narumi Ogawa just happened to be my favorite. I must confess that one of the other high lights of my life was reading the translated instruction manual (Chinese to English) of my swift. I literally collapsed on the floor, it was so weird. Celtic florish pattern from early 90's. Okay, kind of a slow weekend - and that's not a bad thing. I'm making progress on the quilt, having finally figured out what I'm going to do with it. But it's slow, and taking a picture of it at this stage wouldn't be very interesting yet, and the green sweater with gigantic cables is still lovely, but the front looks like the back and that's not very interesting to show (again) so instead . . . . Here is something I had charted probably back in 93 or 94? I did it in Bartlett, in a charcoal grey. It's a nice, flowing pattern, good for woman more than I man (MHO) and I'd like to redo it in black, I think. Maybe continue my new love affair with Encore Worsted. Here's the standard shorthand pattern: Like all my charts, if you're interested in trying them out, they're all pretty much written for light worsted to worsted weight yarn - you could use anything from a wool blend to plain acrylic, I'm not sure 100% cotton would hold it's shape well against the weight of all the cables, but there's no reason not to try it - and I really like charts. But this one lacks full directions - it's just the chart (or about 2/3 of the chart) for the front and back - only I did this one as a raglan. I started with a crew neck with a cable ribbing, added 1/5th of the total number of stitches to increase for the body, and set the pattern at a 2/1/2/1 division of all the stitches. I then increased on each side of the raglans every other round until it was big enough, took off the sleeves, joined the body worked to desired length, then picked up the sleeves and did standard decreasing to the cuffs. Anyway, if anyone wants to take a stab, I can write up better directions that that. I also need to look around and see if I can't find a pattern for socks knit from the toe up . . . . This blog was created as a space to share ideas and pictures of work. It includes knitting, quilting, spinning, some crochet, dying, more things probably, too. It's sort of an online scrapbook so I won't loose so many ideas. You can also find me on Ravelry . All these patterns are in pdf format - all are also available on Ravelry. Links below will send an email to me with the pattern you'd like in the subject line. Please write me a note or put in any comments or questions you have about the pattern in the body of the email. Most patterns are for small/medium but if you send me measurements, I'll design to order. I welcome feedback on my pattern writing, and will do everything in my power to send the pattern to you within 24 hours(weekends may take a little longer). 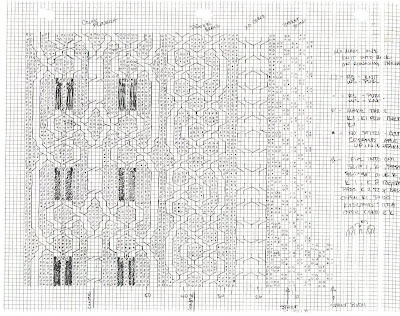 Make your own graph paper - this is awesome!